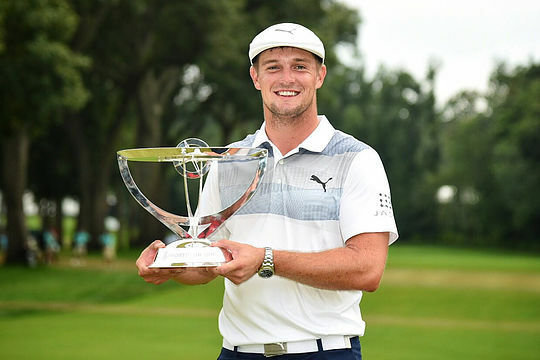 Bryson DeChambeau fired a 2-under 69 to run away with a four-shot victory at the Northern Trust for his second win of the season and the third of his short career. The 24-year-old entered the final round with a four-shot lead and was able to wrap up the tournament by the same margin at 18-under despite some hiccups along the way. “It’s been a lot of hard work this past month,” said DeChambeau, who moved to No.1 in the FedEx Cup standings with his win and knocking off World No.1 Dustin Johnson in the process. DeChambeau’s victory places him alongside some of the biggest names in golf with Jack Nicklaus, Tiger Woods and Phil Mickelson the only other players in history to win an NCAA Championship, US Amateur and at least three PGA Tour title before their 25th birthday. The Californian finished ahead of Tony Finau, who claimed outright second place at 14-under with Billy Horschel and Australia’s Cameron Smith a shot back in a share of 3rd place at 13-under – equalling his best result of the season. Smith, who is coming off the back of a lacklustre run of form including five missed cuts in a row, will be pleased with the result that will see him move to 16th place in the FedEx Cup standings. Smith and Finau are the only two players inside the top-20 without a PGA Tour win this year. “I knew I was going to be in for a bit of a long day trying to chase down Bryson today; he’s been playing well,” said Smith. Despite an eagle at the par 5, 17th today, fellow Aussie Adam Scott was unable to get into gear firing a final round 69 to remain in a share of 5th place at 12-under. The signs are looking good for Scott, however, following a return to form with his outright 3rd place at the recent PGA Championship and today’s finish marking his only two top-5′s all season. A win is surely not that far away. The Queenslander moves from 73rd to 40th on the FedEx Cup leaderboard and is now one solid finish away from securing a spot in the top-30 to qualify for the Tour Championship. Jason Day (T20) and Marc Leishman (T34) were the only other Aussies in the field. Tiger Woods entered the tournament this week with high expectations, however there was to be no repeat of the heroics at the PGA Championship. The 42-year-old fired rounds of 71, 71, 68 and 70 to share an eight-way tie for 40th place on 4-under and sees him slip from 20th to 25th place on the FedEx Cup leaderboard. The Playoffs continue this Thursday at the TPC Boston for the US$9 million Dell Technologies Championship, which was won last year by Justin Thomas.